Yesterday, here on the Kristall Buzz, we posted about a 2012 Limited Edition Swarovski Wild Cat that will be available in April. This Swarovski Lime Panther is a special online release, likely with a price tag of around $1000. Swarovski has another 2012 wild cat figurine that in the Swarovski shoppe and it appears to be available now! It is the Swarovski Jaguar. The Swarovski Jaguar is a crystal golden shadow wild cat. It is approximately 6.5 inches long and 2.5 inches high. The Swarovski designer for the jaguar is Stefanie Nederegger. The crystal brand’s identification #’s for this figurine are 9100 000 344 and 1096796. The MSRP for this wild cat is $420 USD. The jaguar is naturally accented with the familiar wild cat pattern seen on these exotic animals and is standing on a matte finish base. Our favorite crystal brand has produced other wild cat figurines, such as several Swarovski Tigers, Swarovski Lions, and Swarovski Panthers, but none are decorated quite like this one. I have to say, this looks like a ‘must have’ wild cat for my collection. Swarovski collectors seeking the retired wild cats, can find many on the Crystal Exchange America web site. 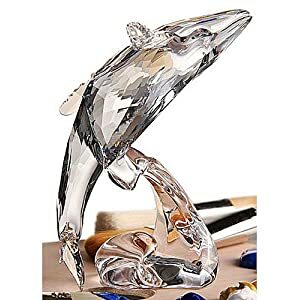 Simply look in the Swarovski Animals category in their online store.